In recognition of the services rendered by Karu Jayasuriya, the Speaker of Parliament, to Buddha Sasana and the society in general the Most Venerable Maha Nayaka Maha Thera and the Sangha Sabha of Malwatta Chapter of the Siam Sect have decided to felicitate him by conferring him the Honorary title of Sasana Keerthi Sri Deshabhimani at a special ceremony held in Kandy. Karu Jayasuriya was born in the historic Siyane Korale which is the hometown of patriotic leaders who led the freedom struggle. He had his primary education at Ananda College, Colombo, and gained professional qualifications in the United Kingdom and France. He joined the Sri Lanka Army as a Second Lieutenant and his fate led him to join the private sector subsequently. He made his mark as an excellent business manager in the private sector. He has held the post of Chairman and Chief Executive Officer of 52 well-known companies and served the country with his expertise by holding various other posts including the chairmanship of the Presidential Commission on Privatization. Karu Jayasuriya who served as Sri Lanka Ambassador to Germany with accreditation for Switzerland and Austria later entered active politics and held the offices of the Mayor of Colombo and the Leader of the Opposition of the Western Provincial Council. Jayasuriya entered Parliament from Gampaha district and fulfilled the duties of the government admirably holding the portfolios of Power and Energy (2001-2004), Public Administration and Home Affairs (2007-2008) and Public Administration, Provincial Councils and Buddha Sasana. He pioneered the presentation of the Right to Information Bill and has chaired several Cabinet Sub Committees such as Cost of Living, Food Security, Establishments and Procurement. Creating a just society by making democracy meaningful within Parliament as well as outside has been his aspiration. He was committed to introducing the 19th Amendment to the Constitution for the creation of a new political culture that targeted good governance. Karu Jayasuriya was the driving force of the movement initiated by civil society organisations and Venerable Maduluwawe Sobhitha Thera to create a system of Good Governance in Sri Lanka based on democratic principles and rule of law. He joined Parliament again through the national list and was unanimously elected Speaker of the Eighth Parliament on September 1, 2015. As the ex-officio Chairman of the Constitutional Council established under the 19th Amendment to the Constitution, he has been vested with the responsibility of smooth functioning of nine independent commissions. He also strengthened the Parliamentary committees by introducing new initiatives such as Sectoral Oversight Committees and opened the sittings of the Parliament to the public by setting up technical facilities for the purpose. Measures were also taken to ensure the welfare of employees. 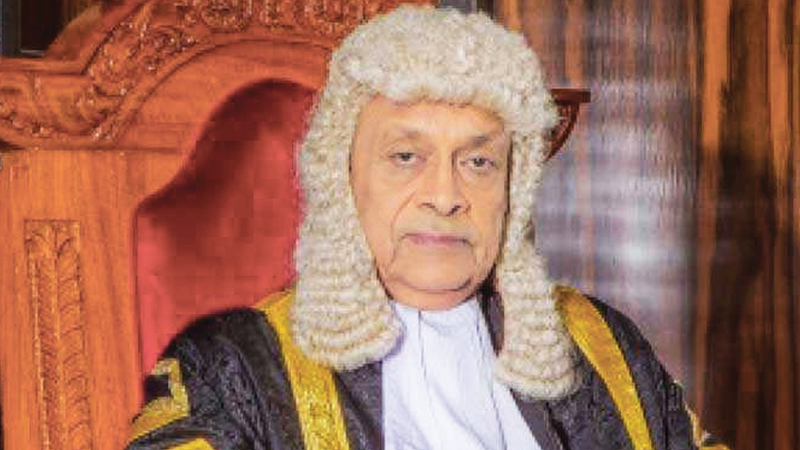 Karu Jayasuriya boldly stood for democracy, safeguarding and upholding the Parliamentary traditions and its integrity at a very crucial period. The whole world is aware of this courageous endeavour. He also set up a standing committee in Parliament to strengthen the religious harmony and co-existence. He conducted successfully a series of provincial level seminars to promote the said concept. Karu Jayasuriya is an internationally famed statesman and a prominent Buddhist leader known to everybody in this country. He is a veteran politician who has conducted himself with dignity and has remained humble right through in his public and private lives. He is a man who has the courage of his convictions. He left all his business enterprises and assumed duties as the Sri Lankan Ambassador to Germany on request. When called back he happily returned and contested the Municipal Council elections and became the Mayor of Colombo. His gentlemanly behaviour is felt and known by all who associate with him. He is fearless in action and plans every detail of his life and leads a methodical life. He is true to his conscience. The things he fears are going against justice, truth and righteousness. His peaceful mindset is unbelievable. He remains unperturbed and calm in problematic situations. He has a humanitarian approach to the problems faced by people. He is wise but does not display his wisdom. He is humble but does not yield to any power. We never see him losing his temper or becoming emotionally disturbed. His personal life is exemplary. He leads and unassuming, principled, simple and elegant life. Ms. Wasantha Jayasuriya is a retired medical officer dedicated to social service. Humanity is the hallmark of Karu Jayasuriya’s popularity, success and greatness. His wealth is generously utilized for worthy causes such as poverty alleviation and meritorious deeds. He established social welfare organisations such as the Suriya Foundation to provide technical training to unemployed youth and to provide medical assistance to the sick and the disabled. He created a Trust Fund with the Public Trustee to help children of Parliament employees to pursue higher education. The uniqueness of Karu Jayasuriya is that he is not racial minded, but believes in the rightful place for every race and religion. He respects and treats all races and religions equally. Jayasuriya’s services are not confined to Sri Lanka but go beyond seas to rest of the Buddhist countries. He carried sacred relics of the Enlightened One to Vietnam as a gift last year. Furthermore, he arranged the donation of a Sapling of sacred Bodhi to newly constructed Tam Chuc Pagoda in Hanoi where the International Vesak Festival is scheduled to be held this year. He was accorded with the World Peace Award presented by the Siddharth United Social Welfare Mission of Bengal in year 2016 and the Order of the Rising Sun constituted by the State Council of Japan under the order of Emperor Meiji, which is awarded to those who have made significant contributions to the world, in recognition of the social work carried out by him. The Abdul Kalam Institute of Technology of India also awarded Jayasuriya the title of “Pride of Asia” for his outstanding contributions to sustainable development. He has also dedicated himself to promote mutual understanding among various ethnicities and in the international arena respecting all religions while serving as the Chairman of “Nikaya Arakshaka Sabha” of Sri Lanka Ramanna Nikaya and as a patron of various national and cultural organisations. On the very pleasant occasion of the conferment of the honorary title of “Sasana Keerthi Sri Deshabhimani” by the Most Ven. Nayaka Maha Thera and the Sangha Sabha of Malwatta Chapter, let us congratulate and wish Karu Jayasuriya good health, happiness and long life with the blessings of the Noble Triple Gem.